Will you be away from your property during tax billing season? If you need to apply for an Early Home Owner Grant because you will not be present on your property during the tax billing season you must submit this "Application for Home Owner Grant Form" and a letter as to why you will not be available. 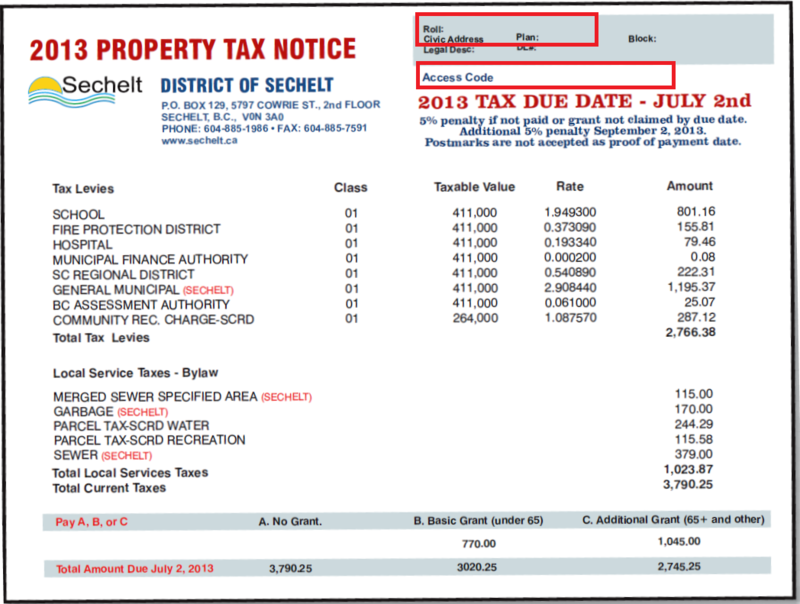 Submit these two documents to the District of Sechelt Municipal Hall office for adjudication. You are able to “Claim your Home Owner Grant” on-line until December 31st of the current year. Click here to Claim your Home Owner Grant Online. A payment is not required to claim your Home Owner Grant; however, you will need the folio number and access code from your Property Tax Notice. Ensure your completed application arrives at the District Office by the tax due date to avoid a late penalty on the grant amount. Please note that the Home Owner Grant application must be completed each and every year in which you are eligible for the grant. Do I qualify for the Home Owner Grant? The additional grant may reduce your taxes by as much as $1045 ($845 + $200 NRAHOB benefit) . To qualify for the grant you must be a Canadian citizen or Landed immigrant who resides permanently in British Columbia and occupies an eligible residence which must be your primary residence. A homeowner may qualify for either the regular grant or the additional grant, not both. To receive the grant, both the owner and the property must meet the qualification requirements. If you are eligible for the Home Owner Grant, the completed application is due by the property tax due date. A penalty is applied to any portion of your property taxes that are not paid by the tax due date, this includes the portion covered by the Home Owner Grant, should you fail to apply before taxes are due. For more information on qualifying and applying for the Provincial Home Owner Grant, download our Home Owner Grant Factsheet and see the following BC Government websites. Beginning in the 2012 tax year, low-income veterans who are not eligible for the additional grant may qualify for the veterans supplement. For complete program details and qualifications, please see the Home Owner Grant Veterans Supplement Information Sheet. Continuing from the 2007 tax year, the home owner grant is provided to some low-income homeowners or occupants who did not qualify for the additional grant because the property exceeded the assessed threshold value. See the Low Income Grant Supplement Information Sheet for more details. You must pay at least $350 per year in property taxes before claiming a regular home owner grant or at least $100 before claiming an additional grant. What is the Northern and Rural Area Homeowner Benefit (NRAHOB)? The NRAHOB is a benefit of up to $200 that is available for the 2011 and subsequent tax years. This amount has been included in the grant figures above. To be eligible for the NRAHOB benefit, you must meet the requirements for the basic and/or additional grant, and your home must be located in British Columbia but outside the Capital Regional District (CRD), the Greater Vancouver Regional District (GVRD) and the Fraser Valley Regional District (FVRD). Sechelt residents qualify for this grant. The Grant Threshold is $1,650,000. You may be able to claim the full grant amount if your property has an assessed or partitioned value of $1,650,000 or less. If you meet all requirements but your property’s assessed or partitioned value is over $1,650,000, you may qualify for the grant at a reduced amount.The grant is reduced by $5 for each $1,000 of assessed value over $1,650,000. This means the grant isn’t available for properties assessed over $1,804,000 in a northern and rural area.